I write this with one hour left to 7 September. I dedicate this blog to a past life memory of possibly dying on this day, on a battlefield in Russia 198 years ago, fighting to sustain the hubris of the First Antichrist foreseen by Nostradamus (see Mabus). Napoleon Bonaparte (1769-1821) was more than a military, political and logistical genius with an estimated I.Q. of 143. When on hiatus from the first turbulent years of the French Revolution, the then newly minted artillery officer relaxed on his native island of Corsica writing a heroic romance novel of surprisingly good quality. Napoleon’s interest in classical history and the antiquities of Egypt during his military expedition there in 1799 not only brought to European civilization’s attention the Rosetta Stone, which delivered the means to translate Egyptian hieroglyphs, but his team of scientists also uncovered and translated into French an Egyptian papyrus best known and published today as the Egyptian Book of Fate. 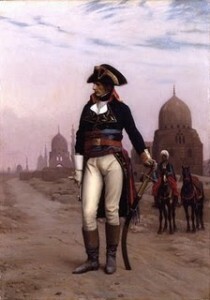 It is said Napoleon carried and consulted it privately before important campaigns and battles to add a little occult spice to his strategic decisions. It is known that his mistress, then wife, then Empress, Josephine, delved into tarot cards and other divination techniques. It is believed she read the prophecies of Nostradamus; however, there is no indication in the writings of or about Napoleon that he was aware the 16th-century prophet had pinned him as the first of three Antichrists under the code name PAUNAYLORON (a code for Napaulon Roy = Napoleon King. Learn more about it here: Antichrist). 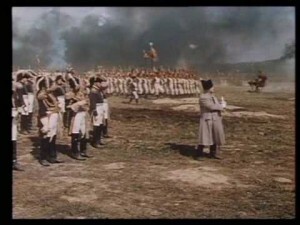 A movie still of Napoleon at Borodino from the Moscfilm production of War and Peace, 1968 -- history's most expensive film ever made. It took six years to make and hired 120,000 extras for the battle sequences. At the present US-dollar value it cost 1 billion bucks to make. In the last six years of life left, he had a lot of time to reflect on the past and predict how his actions would cast a giant shadow on the rest of the 19th century. Hidden within his memoirs and apologies to history are a number of accurate forecasts. He said the “19th” would be “a century of revolutions” foreseeing the fall of monarchies. France did mark two monarchies fall to street revolutions in 1830 (Charles X) and 1848 (Louis-Philippe). 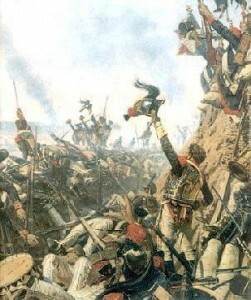 Revolutions would rage across Europe in 1848-49. There would be Garibaldi’s red-shirted revolution that eventually led to the fall of many principalities and monarchies with the unification of Italy. Greece fought more than one revolution to free themselves of the Turks and with the fall of Bonaparte’s cousin, Emperor Napoleon III, a bloody socialist revolution known as the Paris Commune consumed itself and much of Paris in 1871. Napoleon Bonaparte on St. Helena predicted the crowded patchwork of little German states would soon resume and achieve their unification. This they did in 1870-71 when the Second Reich was established. (The First Reich being the Holy Roman Empire and the Third Reich being that of Adolf Hitler). Napoleon foresaw the French people freed of the Bourbon yoke. That happened in 1830 with the fall of Charles X.
Nostradamus’ First Antichrist describes the worldwide spread of the French Revolution with a phrase one might expect from the prophet himself: “from this tripod [its] light will burst upon the world.” It is known that Nostradamus practiced his theurgic-spirit conjuring rites while sitting of a brass tripod like a Delphic oracle. Nostradamus savaged Napoleon in many remarkably accurate prophecies, but overlooked his more positive legacies. In the last prophecy above, Napoleon played his part in self-fulfillment. Though he was a dictator, he had spread the core values of the French Revolution across the continent and though at last defeated, these tenets endured forcing the victorious monarchies to adapt and reform their governments to embrace more human equality and freedom. Even the popes ruling with a Catholic fundamentalist hand tried to rescind Napoleon’s code of laws that prevented discrimination against all minorities, especially the Jews. They succeeded to force Jews back into ghettos only until the unification of Italy, inspired by the French revolution at last erased the Papal States. Sorry Nostradamus, sometimes it takes an Antichrist to teach a Pope how to be a good Christian. PS–My next blog will mark the 9th anniversary of the 9/11 terrorist attack by fashioning an essay based on Jihad Messiah, the seventh chapter of Nostradamus and the Antichrist: Code Named: MABUS. This entry was posted in Prophecy and tagged 1812, 9/11, Anti-semite, antichrist, Book of Fate, Borodino, Charles X, Egyptian prophecy, Elba, Empress Josephine, French Revolution, Garibaldi, Hogue, Josephine Beauharnais, Louis-Philippe, Mabus, Napaulon Roy, Napoleon, Napoleon Bonaparte, Napoleon I, Napoleon III, Nine year anniversary, Nostradamus, Paris Commune, prediction, prophecy, Second Reich, September 11, September 11th, St. Helena, Third Antichrist, Third Reich, Tolstoy, War and Peace, Waterloo. Bookmark the permalink. Post a comment or leave a trackback: Trackback URL.